Gracefully set your table with upscale heavyweight Heritage plastic dinnerware, enhance every event with this amazing convenient and durable disposable dinnerware collection. With stunning gold detail and beautiful ivory finish, your events will be unforgettable! Heritage Bone w/ Gold Trim 10" Plastic Dinner Plates, 10ct. 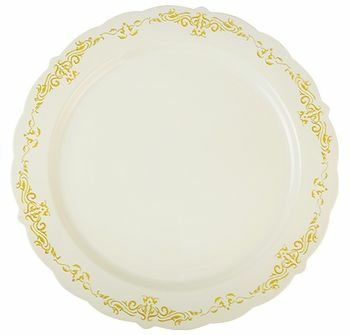 Heritage Bone w/ Gold Trim 7.5" Plastic Salad Plates, 10ct. Heritage Bone w/Gold Trim Plastic 10oz. Soup Bowls, 10 ct.